Please note our Chuffed Crowd Funding Campaign is now closed. If you would like to donate to Edgar's Mission Farm Sanctuary please click here. Stop what you are doing. Leon Trotsky has a 'wheely' important message! Thank you! He is, after all, a pig of few words. But we would like to add our own personal hoopla of thanks. We did it!!!! Or more importantly, you did it!!! 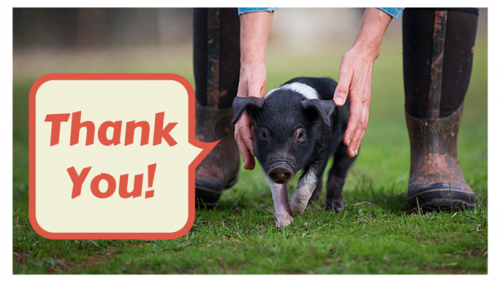 Thanks to the amazing support of our wonderful Edgar's Mission fans and your belief in our work, Project Piggy Paradise can become a reality. Last night at 7.42pm precisely we eclipsed our target goal of $100,000. 'Yee ha!' Leon Trotsky oinks, as he trots down the paddock to share the good news with his piggy pals. On a serious note, Project Piggy Paradise will not only provide our rescued piggies with shelter, shade, warmth, showers, veterinary treatment areas and the like, it will also serve to inspire much needed change in the way pigs are viewed in our wider society. With our farm gates now open to the public (by appointment only) people will be able to see the unique and endearing personalities of pigs shine through, and they will no doubt come to see these quirky creatures as so much more than the before of a ham sandwich. So in the immortal oinks of Leon, thanks a million! Do not fear, if you have not already made your pledge you have until 10.00pm April 2nd, Australian Eastern Standard Time to do so. 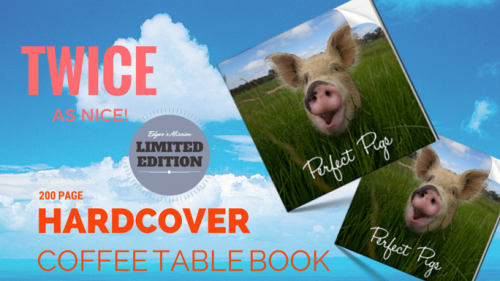 It will also be your last chance to secure your copy of our beautiful coffee table book, entitled 'Perfect Pigs'. All additional funds will go towards our pig enrichment and rescue operations fund. 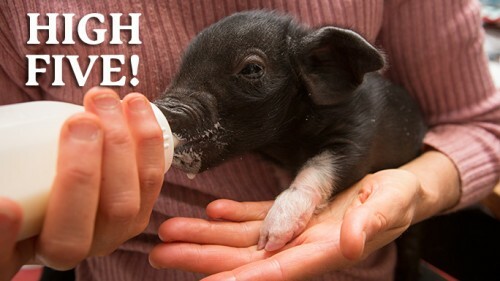 And finally, a huge oink of thanks to Lush, industry leaders in kindness for their amazing donation of $17,000 yet to be added to Project Piggy Paradise total. So Leon, what do you want for your birthday? Please help little Leon celebrate his first birthday, something so very few farm pigs ever get to do. And in true Leon style, he will ensure that all his piggy pals here at Edgar's Mission enjoy the spoils. "Good, better, best. Never let it rest until my good is better and I've built the best pig barn possible". This interesting take on this oft-quoted rhyme is now my mantra and with your help we can make it happen. Since Edgar Alan Pig trotted into my life in 2003 every single day has been committed to making the world a kinder place for both humans and animals. With the acquisition of this most picturesque property, which would not have been possible without the amazing, generous and loving support of kind hearts such as yours, my sights have now turned to creating Piggy Paradise. A place where our rescued pigs can romp until their hearts are content, complete with an amazing barn to house them in and protect them from the elements. This grand design comes complete with stables for snoozing, storage areas for the sweet smelling hay and soft spongy straw and a special animal husbandry area for the safe completion of piggy pedicures and delicate dentals (all necessary to ensure the wellbeing of our porcine pals). We even plan on having a special coolroom for storage of vegetables and fruits to prevent spoilage and, at little Leon Trotsky's insistence, a sensor activated piggy shower! Leon and I are just so excited about the prospect of creating piggy paradise, the benefits of which are many – not only for our porcine pals but to inspire much-needed change in the way pigs are viewed in our world. And as a token of our appreciation of your support for this exciting project, we have some 'wheely wheely' cool perks lined up for you including a beautiful limited edition coffee table book which captures the beauty, sensitivity and splendour of our amazing pigs. We are sure this book, titled "Perfect Pigs" will one day become a much sought after collector's item. So trotters up, are you in? Leon and I sure hope so! $25 - High Five, Friend! $50 – You've got a Friend in me. Become Leon Trotsky's Best Buddy and receive an email Buddy Pack, featuring a certificate and some 'wheely' great pics of your new pal! Plus, you will also receive a digital high five from Leon Trotsky. $89 EARLY BIRD – A Picture is Worth a Thousand Words! Receive our limited edition coffee table book, complete with breathtaking photographs of our happy resident pigs (includes free shipping in Australia - International book orders please select 'Friends Over The Ocean'). $129 – A Good Book and a Good Friend – Two of Life's Greatest Gifts! And we've got you covered! Receive our limited edition coffee table book, complete with breathtaking photographs of our happy resident pigs, as well as becoming Leon Trotsky's Best Buddy free for a year (pack sent via email). (Includes book at discounted price of $79, free shipping in Australia, plus a $50 tax deductible donation towards the new pig barn. $129 – EARLY BIRD - Friends Over The Ocean! Receive our limited edition coffee table book, complete with breathtaking photographs of our happy resident pigs, as well as becoming Leon Trotsky's Best Buddy free for a year (pack sent via email). Please contact us if you would like to order more than one copy. $150 - EARLY BIRD - Twice as Nice! $250 – Snout of this World! 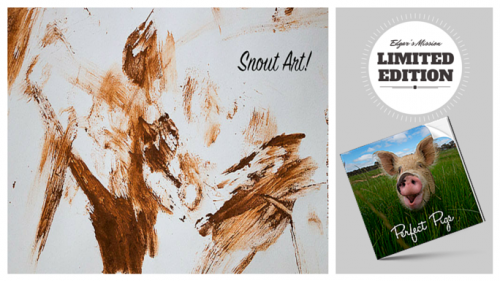 Receive your very own Snout Art, painted by Leon Trotsky and his pals, PLUS our limited edition coffee table book, complete with breathtaking photographs of our happy resident pigs, as well as becoming Leon Trotsky's Best Buddy (pack sent via email). (Includes snout art print, book at discounted price and a tax deductible donation towards the barn of $121). Sponsor a stable in our Piggy Paradise Barn. We will hang a plaque on the stable door with your name on it. Plus receive our limited edition coffee table book, complete with breathtaking photographs of our happy resident pigs, as well as becoming Leon Trotsky's Best Buddy (pack sent via email). (Includes book at discounted price of $79 and a tax deductible donation of $921) (Free Worldwide Shipping). $5000 - Take Your Kindness to Lofty New Heights! Sponsor the hay loft in our Piggy Paradise Barn, which will store our resident porcines' tasty hay and soft, comfy straw. We will hang a plaque in the hay loft with your name on it. Plus receive 2 copies of our limited edition coffee table book, complete with breathtaking photographs of our happy resident pigs, as well as becoming Leon Trotsky's Best Buddy (pack sent via email). Sponsor the Piggy Paradise Pier. We will hang a plaque on the pier with your name on it. Plus receive our limited edition coffee table book, complete with breathtaking photographs of our happy resident pigs, as well as becoming Leon Trotsky's Best Buddy (pack sent via email). Please donate and share NOW to help make Piggy Paradise come to life! Edgar's Mission is a registered national not-for-profit organisation. If you select a perk when you give your support, we'll be in touch with you after the campaign finishes with a follow-up. In the meantime, if you have any questions about your donation, please email us. 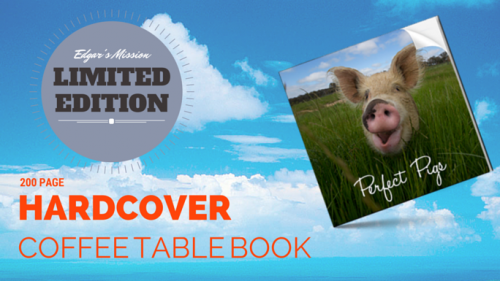 Perfect Pigs Coffee Table Book is not tax deductible. All donations over $2 are tax deductible and receipts will be issued to you via email. If you select a perk that includes a coffee table book, your receipt will reflect the price of the book and the donation separately. 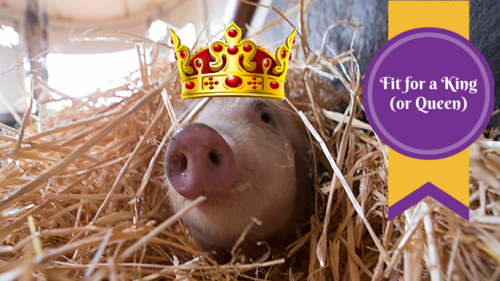 Leon Trotsky needs your help to create the perfect piggy paradise here at Edgar's Mission! 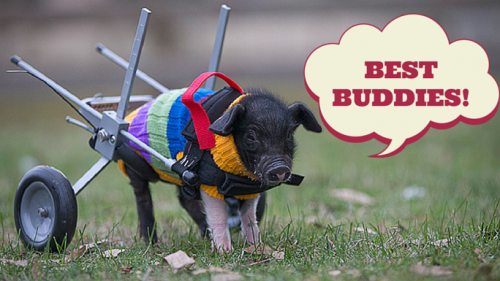 This pig dreams big, and has some 'wheely wheely' neat perks lined up for you! So trotters up, are you in? Please help little Leon celebrate his first birthday by donating $10 to help make Project Piggy Paradise become a reality! $89 A Picture Is Worth A Thousand Words! EARLY BIRD SPECIAL! $50 You’ve got a Friend in me! Become Leon Trotsky’s Best Buddy and receive an email Buddy Pack, featuring a certificate and some ‘wheely’ great pics of your new pal! Plus, you will also receive a digital high five from Leon Trotsky. $129 A Good Book and a Good Friend – Two of Life’s Greatest Gifts! $129 Friends Across The Ocean - EARLY BIRD SPECIAL! $159 Twice as Nice - EARLY BIRD SPECIAL! $250 Snout of this World! Receive your very own Snout Art, painted by Leon Trotsky and his pals, PLUS our limited edition coffee table book, complete with breathtaking photographs of our happy resident pigs, as well as becoming Leon Trotsky’s Best Buddy (pack sent via email). (Includes snout art print, book at discounted price and a tax deductible donation towards the barn of $121). $5,000 Take Your Kindness to Lofty New Heights! Sponsor the hay loft in our Piggy Paradise Barn, which will store our resident porcines’ tasty hay and soft, comfy straw. We will hang a plaque in the hay loft with your name on it. Plus receive 2 copies of our limited edition coffee table book, complete with breathtaking photographs of our happy resident pigs, as well as becoming Leon Trotsky’s Best Buddy (pack sent via email). $2,500 Shower our Pigs with Kindness! $500 Fit for a King (or Queen)! $79 EARLY EARLY BIRD! - A Picture is Worth a Thousand Words! * $31,745 in offline donations included in total.